Large detached villa for sale in Buenavista, Benissa Costa. 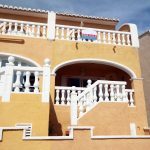 This five bedroom, three bathroom villa has self-contained accommodation distributed over three levels, in a very quiet residential location with open views. MID LEVEL. Open plan lounge, dining kitchen area, inner hallway, one double bedroom, and modern family bathroom. Door into separate studio apartment comprising, one double bedroom with en-suite bathroom and kitchenette. External staircase to LOWER LEVEL. Open plan lounge, dining kitchen area, inner hallway one double bedroom and modern family bathroom. OUTSIDE: External steps from upper naya, 8×4 meter private swimming pool, sunbathing terrace, BBQ, seating area, garage, terraced gardens. Located in a very quiet residential area this property is accessed from road side via a pedestrian gate with a paved pathway leading to a partially glazed front door. The front door provides access to an open plan lounge, dining and kitchen area with an inner hallway leading to two good sized double bedrooms separated by a family bathroom. External steps around the side of the property lead down to the mid-level accommodation and a front door providing access to an open plan lounge with dining and kitchen area. An inner hallway leads to one large double bedroom and modern family bathroom. A connecting door (that can be closed and locked) provides access to a totally self-contained one bedroom apartment with independent access. The one bedroom apartment comprises a double bedroom with en-suite bathroom, a kitchenette and a door for external access. External steps around the side of the property lead down to the lower-level accommodation and a front door providing access to an open plan lounge with dining and kitchen area. An inner hallway leads to one large double bedroom and modern family bathroom. OUTSIDE: An external staircase from the upper naya leads down to the 8x4m rectangular private swimming pool. The pool deck has sufficient space for several sun loungers and a path from the pool deck leads to a delightful large sun terrace ideal for al fresco dining or relaxing with a book and a glass of wine. This property could make an interesting investment for someone requiring additional revenue from rental income.